So excited to report that we will be heading down to San Diego this week for a much needed vacation. We rented a little beach house and plan on taking Darcy to play in the water every day! I also plan on eating California burritos from my favorite Mexican place. They put freaking french fries in them, people! And the tortillas just don't exist outside of San Diego. Man, can't wait! Rachael Ray was nominated for a Daytime Emmy for Best Talk Show Host and her show was nominated for Best Talk Show (Entertainment). According to Grub Street, Rachael Ray can't kill a lobster. The Huffington Post discusses Rachael Ray's campaign to keep school lunches funded. Rach also held a press conference with Mayor Bloomberg about school lunches and encouraging kids to grow their own food. This Huffington Post article does a great job of explaining the obstacles Rachael is up against in her fight for fresh school lunches. The NY Daily News says this is an awkward moment, but I just think Rach was trying to keep the conversation focused on school lunches (the whole reason she as there). According to The Hill, Rach spread some sunshine on Capitol Hill. 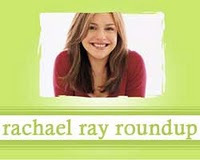 Check out this behind the scenes video from Rachael Ray's talk show. Jessica of Eat Veggie Cook made Rachael's Butter and Parm Squished Potatoes.